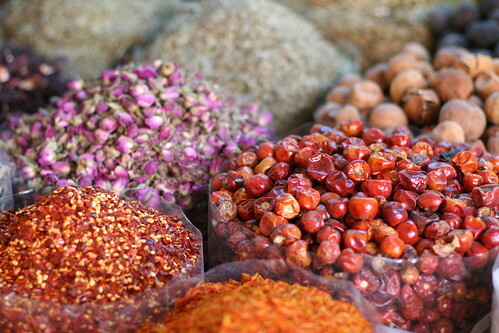 #500, The Dubai Spice Souk, and A Giveaway! This is my 500th post. I don't really have words for how much food that is. Could you imagine sitting down to a meal of 500 things that I've cooked and baked? That would be so nutty. Sometimes I look at my blog traffic and try to imagine all of those people in the same place at the same time, bonding over good food. That would be nutty too. And an amazing party. I have a tradition of pausing every hundred posts (#101, #200, #300, #400) to reflect on Playing House. Post #300 is still my favorite thing I've ever written, and it all still rings true. In honor of me actually maintaining a hobby for more than 5 minutes (which, before starting this blog, was completely unprecedented), I have the best giveaway ever to share with you. It's genuinely one that I would be excited to win, and I hope you will be too. As you may know, I'm currently living in Dubai. Three winners of this giveaway will receive a package from me with an assortment of spices, herbs, and seasonings from the Dubai Spice Souk (market)! Leave a comment on this post by midnight Pacific Time on Wednesday, February 16th, 2010. You can say anything, tell me who you are, where you're from, what you like to cook, how you found Playing House, share your favorite recipe, or just say hi! 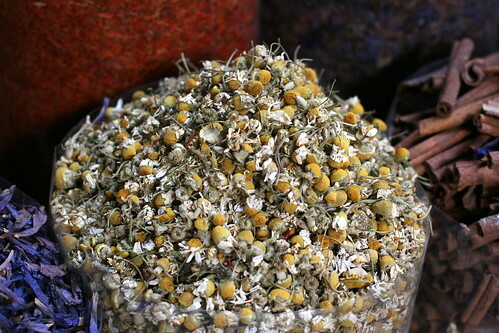 I'd also love it if you would tell me your favorite dried herbs & spice(s). No guarantees, but it's possible that I can accommodate requests for the winners. I'll choose three winners on Thursday using a random number generator. Thank you so much for being here, this whole game wouldn't be nearly as fun without you. Edit: Entries are now closed, thanks to all who commented! I don't remember the exact process through which I found your blog (just recently), but I love it! I'm a Canadian expat who follows your blog from Zurich, Switzerland. We moved here so that my husband could pursue a job opportunity (much like your Dubai story). I spend most of my time writing, but I'm also trying to become a better cook. Your delicious and clearly explained recipes are a great help in this regard, so thank you! How exciting! I love trying out new exotic herbs and spices! amy! congrats on 500 posts, that's AMAZING. i'm so proud of you! 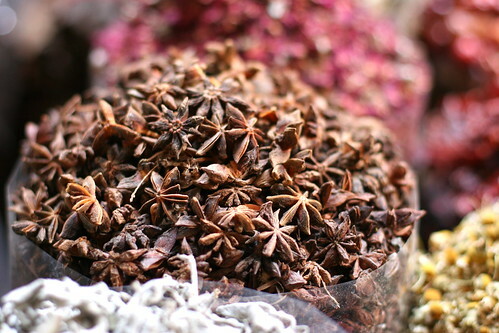 and your photos from the spice souk are so, so lovely. it looks like an incredible place! Oh my goodness, what an amazing prize! At this very moment I have your pad see ew in my fridge, which is indicative of why I love your blog so much - delicious, low-key, time-tested recipes that I make again and again. Thanks for being someone all of us can depend on for constant culinary inspiration, Amy! These pictures are gorgeous and such an amazing giveaway! I found your blog on a couple of other blogrolls and was hooked. Hi Amy! My name is Michelle and I found your blog by searching online for instructions on how to make a rainbow cake! Your post taught me how and now it's one of my most popular cakes! I stay and continue to read because of all of the yummy recipes that you post. I also enjoy your writing style. My husband is Indian so I am always trying to keep up with Indian and middle eastern cuisine for him. I would love to receive spices from the area! The pics of the herbs are amazing!! We love to cook in our house and my husband finds a way to incorporate many different spices. Our kids love trying new flavors. Our Daughter will be 4 in March and our Son will be 1 in March. I live in the foothills of the Blue Ridge Mountains of NC, where we're fortunate enough to have a vibrant local food scene. My favorite cuisines are Italian, Mexican, Indian and Thai - the spicier the better. Thanks for the great posts, inspiration and recipes - here's to 500 more! Congrats on your 500th post! That's amazing! I'm not sure exactly how I found your blog, but I do know it was through my frequent searches for new baking blogs. In the last year, my passion for baking has blossomed into so much more - it's a creative outlet, a safe place to fail, a safe place to succeed, and so tasty and fun. I'm not sure what I would do if I couldn't bake anymore. I think your giveaway is a great idea - it's super fun and how exciting for those who win! One of my favorite genres of food to cook is indeed Indian Food, so I have some favorite spices - cardamom (I also use this in baking frequently! ), saffron, garam masal (a mixture of spices) and any and all kinds of curry powder! Hey congrats! Love you blog and the pictures. They are beautiful! Congrats on #500!! Not even sure how I found your blog, more than likely a link from a link from a link. 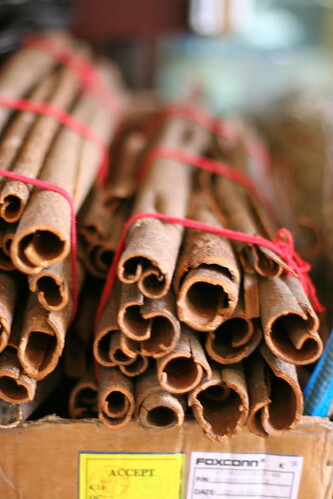 Your picture of the cinnamon was amazing! I found your blog through EAD, and have been following for about a year? I'm from Chicago, now live in San Diego, and didn't cook anything interesting until we got married. Now I'm trying 1-2 new recipes a week, and learning as much as I can about cooking. We're also getting into more fresh ingredients and less meat, but don't want to sacrifice taste! I would love to experiment with a new spice I've never used--( grow most of the basics in pots on my patio) Some that come to mind are curry, fennel and saffron. Hey Amy...congratulations on your 500th Blog Post. I know it's quite the task to keep a blog going and interesting! And you have certainly succeeded! I may not alway comment on posts, but I do read your posts (usually on Google Reader!). I hope you are having a fantastic time in Dubai and I can't wait to read more about your adventures over there! This is a fun giveaway idea! What about saffron...? I started blogging a year and a half ago, and since then it has morphed from a casual hobby into one of my favorite things to do! I agree with Rachel - saffron sounds fantastic! I love trying new things, so any spices to experiment with would be awesome! Thank you for all your great recipes! Yay! 500 posts! Those spices are lovely! Silas loves food from "over there" and I'm trying try some new recipes - I'd love some new spices to use! Dearest Amy - You have me so excited for my own trip to Dubai I can hardly stand it! As a self declared science geek, I am super fascinated by the powers of turmeric and do not use it often enough. Wow! This is an awesome prize. 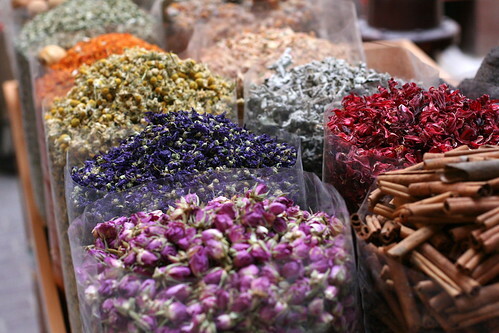 I have been to the spice market in Istanbul, but didn't feel like I picked up nearly enough fun things once I got home. This package would be awesome to try out! Congrats on 500! I remember your 300th post, too, and I've enjoyed every other one just as much. Congratulations on #500, and thanks for continuing to inspire us in the kitchen! Congrats on #500! It's been so fun catching up with you again via blogging! And I love your stories, adventures, and beautiful photographs. Thanks for sharing your fun! Wow! 500 post and an AWESOME giveaway to celebrate. I found you from the blog, Open Roads Mama. Can't wait to spend some time visiting with you. As for spices and herbs, I love cumin, nutmeg, paprika, basil and rosemary. Wow, 500 posts! I can't imagine my blog being around that long and I can't wait for that day! I found your blog on tastespotting and I have been following you since before you moved to India. I would love, love, love spices from your new home! Congrats on hitting 500! I found your blog a couple months ago, but I can't even remember which blog I saw it on (a Weddingbee blogger, perhaps?). As for what dried herbs/spices we'd pick, not a clue! We cook lots of different cuisines, and I love sweeter curry, but we really want to learn more about Indian and Thai cooking/ingredients. I really enjoy reading your blog and I have loved the tidbits you have shared about Dubai. My husband and I are American Expats currently living on the island of Saipan. It's in the middle of the Pacific. There are many times we feel lost on this little piece of land compared to the vastness that is the surrounding ocean. 500 poats! Amazing! Mazel Tov! I found your blog through my sweet elementary and high school friend, Andi!!! She recognized my love of cooking and suggested I follow her darling daughter's blog! Thanks for the tip, Andi! Those pictures are fantastic!! I've been exploring Arabic food lately (my husband's Arab - from Tunisia) and would just love any interesting spices! Hi- from snow covered Kansas! Love your beautiful photos- makes me what to plan a little trip to Dubai. Congrats on 500 posts! I'm in awe of the variety and beauty of the spice souk. I am completely unfamiliar with any of the spices they have in Dubai so it would be such a treat to experiment with them! I "met" you through the Daring Bakers challenges you used to do. 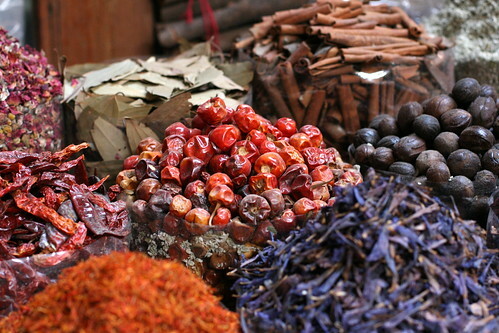 I love your posts from Dubai, and would be terribly thrilled to play with some of the spices from the area. um. amazing. i love spices. especially indian and middle eastern types. oh and thai ones. i don't know where i first saw you blog but i do love it. thanks for all the great recipes and things. I love spices, especially really hot and flavorful ones :) Love the blog. Wow 500! That is so incredible. And, I am loving your posts about your journey in Dubai. I'm more than slightly jealous. Holy Moly, what a fun giveaway! Congrats on 500 posts! Hmmmmm.... currently, Tarragon is my favorite spice... along with my forever-love crushed red pepper flakes! Hi Amy!!! I love seeing your adventures and am looking forward to making our friends b-day cake :) It will be like you are there with her. Looking forward to more pretty pictures of the Middle East! Dubai is an exciting place with great food! I hope your stay is all that you hope for! My name is Melonie and I think the photographs on this post are amazing - so many colors and textures... I wonder how amazing it must be to shop at a market like this! oh my goodness. what amazing pictures and what an amazing giveaway! I would love to win! I found your blog from someone here in the EUG when you were living here. I've been watching Artii Parti on Food Network and am interested in the spices she uses. Enjoying your blogging from Dubai! Congratulations on Post #500! What an accomplishment! I started following your blog after we became facebook friends. It is so much fun to reconnect with someone I knew in high school and to find that we share a common love for cooking, baking, and experimenting with food! I've tried several of your recipes (I think I made your strawberry lemonade bars every week last summer) and have yet to be disappointed! I have lots of favorite spices, but I would have to say my very favorite, both because of taste and smell, is rosemary. Again, congratulations on your 500th post! I look forward to reading the next 500! Oh Amy, how cool. 500 is an amazing accomplishment, not to mention how wonderfully you've done it. Congrats on everything to this point and hoping the next 100 are filled with joy and magnificent memories! I am SO happy this is your 500th Post! Congratulations, not only for sticking with something and proving to yourself that you ARE all that, but for putting together something so fabulous and inspiring! I love reading your blog! Congrats on 500! You know me already, so I won't get into that... but I will say that I have been continually impressed by your blog and even more so by your photo skilz! I love the spices required to make curry and chai. YUM! not sure how I found your blog, but love reading about your adventures. Amy! Yay for 500 posts and for Dubai! Hope all is well. I'm Ann from the mountains of the Shenandoah Valley in Virginia. I've enjoyed learning new recipes from you, and have tried several. Thank you for bringing us along with you to Dubai - it's been such a treat to "see" the city through your posts! Hi! I found you website through Stumble and always love a good cooking blog! As a college student moving into a house, I would like to build up my non-existent spice cabinet (consisting only of salt, pepper, garlic salt, and red pepper flakes T_T). Congratulation on your post-iversary! Wow - post #500 - AMAZING! Congratulations. I started following your blog after I found you via Twitter...and I have absolutely loved following along so far! I am so intrigued by your adventures in Dubai. The spice giveaway sounds absolutely amazing - I love trying new flavors! Here's to the next (awesome) 500 posts! Congrats on 500 posts! I just found your blog - today, actually - from Eat, Live, Run and I got sucked in immediately. Plus, I'm a social worker too! :) I can't wait to explore more and try some of your recipes! Those pictures are gorgeous! I love colorful markets! The smells and the overwhelming sensations--sight, sound, and smell-- are perfect. I love spices, the hot and spicy, the deep and mellow, and the transformation they make in a meal. I just ate a well-spiced bowl of chickpeas and chicken for lunch. And happy Valentines Day to you! Amy, Congratulations on following through with Playing House and finding creative elements within yourself in the process. 500 posts is no small accomplishment! I liked the idea of the party you described. I loved that about our wedding-looking around and seeing all of our friends and our families friends- together in the same place having a meal together. Such a neat atmosphere! Hello! I found your blog through another blog I have followed....they mentioned one of your recipes; the Nutella cupcakes....which I just made tonight for Valentine's treats :-) I posted a picture of them on my facebook account, and had comments from people I have not heard from in a long time.....the things a little sweets can do :-) They are so simple and so yummy!!! I think I stumbled across your blog when I was still living in France and had just started my own blog. I don't comment much any more (because now I'm back in the States and back to my full-time job), but I still follow you! 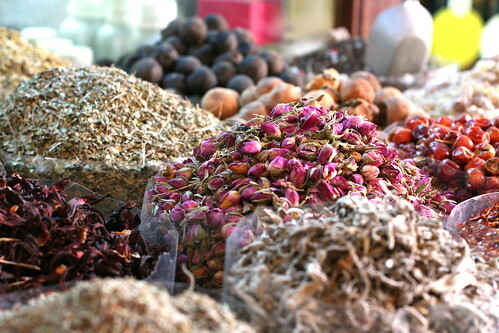 I'd love to know more about the spices and herbs that are common in Dubai and what they're used for! WInning your spice pack would be great. I love to experiment with various spices. Hi Amy! I just found your blog today but I love it! Congratulations on making 500 posts. I've always wanted to start blogging but never felt I would keep with it. This gives me inspiration. The pictures of the spices look so beautiful. I've been trying to use more spices in my cooking to try new tastes so this looks awesome. congratulations!! fabulous prize. fabulous! my name is kelli and i found your blog through google. Just found your blog today in a search at foodblogs.com. Looking forward to reading your older posts. Thanks! I'm so sad I missed this giveaway, but WOW. These pictures make me want to pack up a few suitcases and move somewhere exotic right this very second. Your photography skills are *amazing* and I'm blown away by what food blogging can do for your photo skills. I just found you through my love of dulce de leche and cupcakes. Thank you sharing! I'm married to a chef and no, he doesn't do a lot of cooking at home. However, I love to cook and have become pretty good at it thanks to my human cookbook. I'm always looking for new and interesting recipes and often combine several to get the desired effect. Although I'm new here, I love your blog. Congrats on post #500!